Inventor Adri Hartveld was born on a farm in The Netherlands (see www.sintnicolaashoeve.nl). 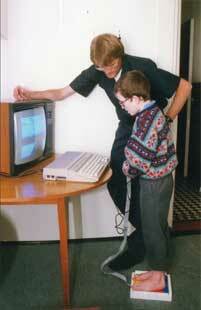 As a hyperactive, un-coordinated boy with poor posture, he suffered from episodes of back pain and foot problems. He was very interested in sport and frustrated that he could not do as well as his peers despite having lots of energy. This lead him to his long quest of finding health and fitness solutions. In 1982 he qualified as a physiotherapist and moved to England. Equipped with a lot of knowledge on how to strengthen the human body and prevent injuries, he combined his physiotherapy work with running 100 miles per week over the hills of North Staffordshire. This resulted in him winning many long distance races and becoming the Dutch National Marathon Champion in 1986. Adri continued his studies with Keele University under the guidance of Dr John Hegarty and developed practical applications of the large theoretical knowledge he had gathered. To make the physiotherapy exercises more effective and enjoyable for his young patients he developed balance and fitness exercises with computer games (see (link) pdf files of 2 articles). This “Compex” system with its balance board (patented in 1998 GB2288550 see http://worldwide.espacenet.com and switches were the forerunner to the Wii Fit and the Wii Board. The publications on “augmented feedback” continue to be used by physiotherapists to link movement science theory with practical exercises and computer games (see (link) pdf files of article). Together with podiatrists and academics in North Staffordshire Adri developed biomechanical devices to improve posture and aid in injury prevention. 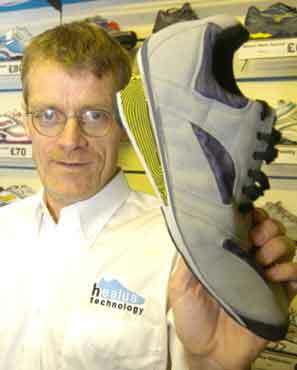 Running many miles on the roads of Staffordshire was the ideal testing ground, and Adri resurrected his running career by testing prototype shoes and shoe inserts. In 2000 he won races on the world’s first running shoes with multiple springs in the rearfoot and the forefoot. 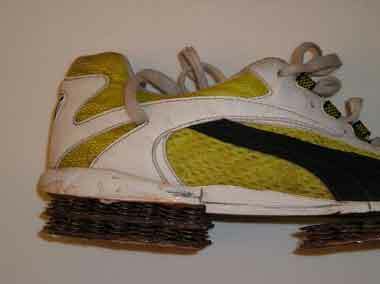 Because of the high forces in fast road running the soles broke down. Adri even finished races with having to carry parts of his soles in his hands and in his shorts…….it was back to the drawing board. Adri continued to work full time as a physiotherapist for the NHS in North Staffordshire, and cobbled in his garage at the weekends and evenings. In 2005 Adri had developed the Healus shock plate which allowed a heel-less shoe design with Sole Force Distribution (SFD) and Sense Enhancement (SE). 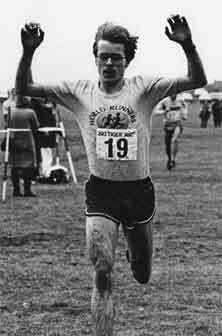 As a 45 year old he was the overall winner in the Wolverhampton Marathon and other distance races. He also demonstrated the effectiveness of the shoe design in the Staffordshire University laboratory with podiatrist David Dunning, professor Nachi Chockalingam and biomechanist Andy Greenhalgh. It was time for commercialisation and Healus Ltd was set up. The EC funded project HEELLESS validated the SFD SE heel-less concept and provided a large pool of data which demonstrate that a heel is not necessary in a running shoe. Replacing it with a shock plate with certain material characteristics will provide a range of advantages. By 2011 110 trial athletes have demonstrated various benefits of the patented design, without suffering the side effects that critics expected.